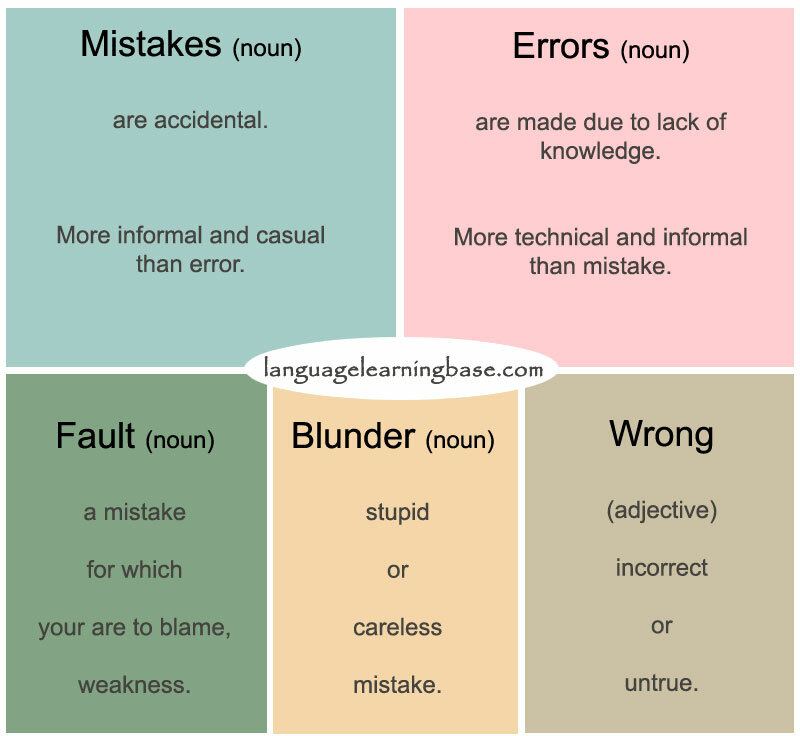 MISTAKE, BLUNDER, FAULT and ERROR mean something done incorrectly or improperly. MISTAKE is the most general term used of everyday situation. ERROR is more suitable for more formal contexts. Some may consider ‘error’ to be much more severe than ‘mistake’. FAULT implies that you are talking about culpability or responsibility. BLUNDER is a careless mistake often unnecessarily or resulting from misjudgment. WRONG means that something is not correct. It is an adjective. It was a big mistake to leave your umbrella at home. Coming to this place was a big mistake. We only wasted our time. It was a mistake to go there on Sunday. I committed a mistake of leaving our bedroom window open. The grammatical errors in this Book could not be ignored. The essay contains a number of typing errors. The computer produced an error when the data was incorrect. His speech contained several factual errors. I made an error in my calculations. It was not his fault that his team lost the match. It was my fault that there was an error in the computer program. I made a terrible blunder in introducing that beautiful girl to my husband. He said that the tax was a major political blunder. I made a blunder by getting his name wrong. Some of your answers were correct, and some were wrong . Something is wrong with my cellphone . Don't cry, honey. Tell me what's wrong. You're wrong: he's not Superman at all.